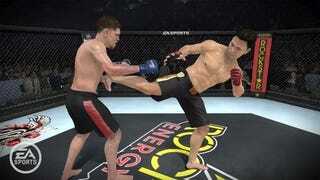 I was outclassed last week by the other games reporter watching a demonstration of EA Sports MMA. He knew the name of the game's fighters, the name of the referee — and — he knew the ref's shaving habits. I am an oddball who likes boxing and pro wrestling but has never had the urge to watch a round of mixed martial arts. I did not know the names of the fighters (Nick Diaz vs. Cung Le), the name of the ref (John McCarrthy) nor the ref's shaving habits. Well, even the EA people showing the game did not know that Big John sometimes has facial hair and sometimes doesn't So they couldn't confirm to the reporter who was outclassing me whether the ref would have an alternate-facial-hair optioin in this fall's EA competitor to THQ's hit UFC Undisputed series. I was trying to figure out the the best question as the developers toppled their combatants into a ground grapple and told me that either fighter can still strike while locked on the ground. That means either player can still feel like they had something too do while their guy was on the ground. They let the fighters stand up and tried to show some brutal hits. Blood started to fly. I had been forming a thought about how violent this game would be, because I know MMA is pretty violent. That was going to be my question, but the blood was answering it without me having asked. As if he read my mind, one of the EA representatives proudly declared that blood spilled by one fighter could mark the other fighter's body. I got an idea and asked what I was sure was an important question: "Can you break bones in this game? Break a guy's arm?" The EA developer replied: "We're not saying anything about submissions yet."